LIFEPATH aims to understand how to reduce health inequities through a life course approach. Early life exposures to particular socio-economic conditions may indeed have a relevant long-term impact in late life. This implies a representation of health more as a trajectory than as a static status. Such a dynamic conceptualization comes from the life-trajectory model proposed by David Blane, which describes life and ageing as continuous processes, made up by two main stages: the “build-up” phase, which begins at conception and ends in late adolescence, followed by a “decline” phase. Exposure to low socioeconomic conditions during the first stage of the curve can have a negative impact on the maximum level of health that can be attained. During the decline stage, individual capacity, function and wellbeing will start to decrease, with the socioeconomic status (SES) being a relevant influence on the rate of this reduction. 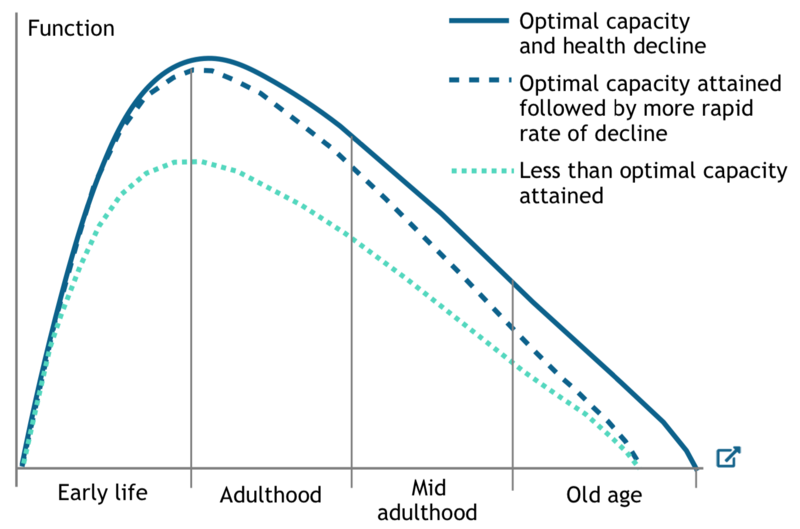 The gap between social groups in terms of mortality, functional performances and cognitive capacity accumulates over the two phases, resulting in widening inequalities with ageing. However, biological changes due to adverse environmental and social circumstances are potentially reversible and preventable, although rapid deteriorations triggered by phenomena such as the economic recession are possible as well. The characterisation of the interconnections between socioeconomic conditions, health status and biological variations will thus provide a new and effective framework to understand the impact of broad social changes and to develop future policies.